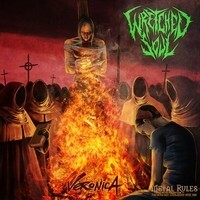 Described as one of the UK's most promising thrash metal band's WRETCHED SOUL are releasing their first début album “Veronica” through Dark Lord Records. The album is produced by Chris Tsangarides who has worked with bands such as JUDAS PRIEST, EXODUS, BLACK SABBATH and KING DIAMOND. The band are extremely hard to describe as a genre, they have hints of every metal genre possible. Opening track “Where Shadows Ride” has a standard thrash riff with rough growl vocals, the vocals are less than impressive until Power Metal-esque vocals are encountered in the chorus. It's hard to believe that Chris Simmons can have such a powerful vocal range. The harsh vocals feel they should have been layered more in production, they feel very weak and thin. Opening up with blackened death metal riff and harsh drums “Summon The Hunter” is one of the stronger tracks of the album. Andy Clifford's drum technique heavily stands out along with Steve Clifford's guitar skills, he obviously knows how to write a great guitar track to head bang to. Title track “Veronica” has constantly changing speeds of riffs which make it quiet difficult to listen to. The vocals are very similar of Austin Dickinson, the lead vocalist of RISE TO REMAIN. This is a very good track, easily one of the best of the album Steve Clifford's solo at 3.34 is impressive but the constantly changing riffs give you a migraine with the changing speeds. If it was kept at the same speed it easily would have been a hit. “Undying War” is the best track of the album, you can really feel each members input of the track. Chris's vocal range can go from the lowest growls to the highest points of his vocal chords, Andy's drumming is heavily thrash influenced. Very much in the style of SEPULTURA. Luke Mayall and Steve Clifford work well together to create a death/thrash inspired bass and guitar parts. This song really shows why they have been named one of the UK's most promising thrash acts and are so hard to put into one genre, they include parts of all Metal genres. Chris's vocals sadly sound strained on 'Wounded Illusion' though the track is still a song to bang your head to, the guitars are very simplistic. The drums are the most impressive part of the song, showing how fast Andy can play. ”Black Wings Of Treachery” opens up with an epic drum fill by Andy and almighty screech by Chris. A blackened Thrash track mostly focusing on Chris's low rough, dark vocals, the song has a haunting atmosphere to accompany it; the guitars are slightly distorted with a mix of simple but complex chords. This is a song for fans of TOXIC HOLOCAUST and VENOM. ”The Unmaking”has an easy melody with rough vocals. One of the weakest songs but Steve's guitar has simple but fun riffs in every part of the song. The best part of the track is Andy's drumming. Fun, fast and complex he really shows what he can do as a drummer. ”'Dash to Destruction” is the closing song on the album, opening with a drum solo by Andy breaking into hard thrash. The guitars are a similar style to EXODUS and MUNICIPAL WASTE, you can tell the effect that Chris Tsangarides has had on the album production. The gang vocals towards the end of the song really sticks to the Thrash Metal label the band have been branded. As soon as you think the track has ended you are faced with a full on thrash solo from Steve's guitar, it just keeps getting faster and faster. This is one of the best songs on the album and is the best song they could have picked to close it. WRETCHED SOUL are going to be huge, no doubt about it. The UK is brimming with new acts but few break through but with the band's raw power they aren't going to be unnoticed. The thrashers know how to include parts of different Metal genre's and create into a super mix.